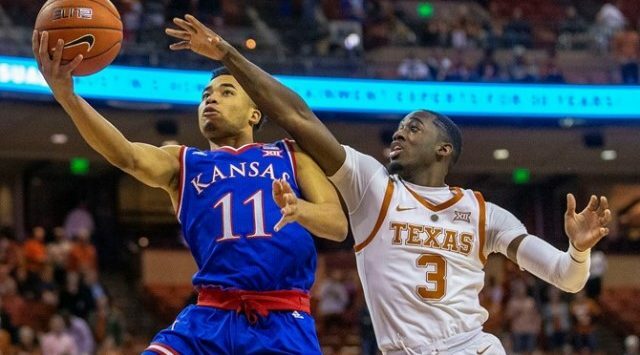 AUSTIN, Texas – Trailing by double-digits on multiple occasions, KU cut its deficit to four points in the final minute, but the comeback fell short as Texas held off the No. 11/12 Jayhawks, 73-63, Tuesday night inside the Erwin Center. Freshman guard Ochai Agbaji led all scorers with a career-high 24 points but 10 3-pointers along with 21 free throws helped the Longhorns knock off the Jayhawks for the first time in their last 11 tries. Kansas’ loss, which marked just the third two-game losing streak for the Jayhawks in the last five seasons, moved KU to 16-5 on the year and 5-3 in league play. Texas elevated to 12-9 on its season and 4-4 in the Big 12. The first 15 minutes of game action were anything but pretty for the Jayhawks. A host of missed shots and a handful of turnovers saw KU tally just two field goals over the first nine minutes of the game. Meanwhile, the Longhorns converted on five first-half 3-pointers to build a lead of 11 points, 23-12, with just under six minutes to play in the opening half. Kansas managed to close the first frame with a flurry to get back into the game before the intermission. A Dedric Lawson steal and a Marcus Garrett lay-in ignited an 11-3 KU run to close the half. Agbaji chipped in seven points during the spurt and helped his team pull within three points, 26-23, before the halftime buzzer. Agbaji again helped his team keep pace in the early minutes of the second half with five points in the five minutes after the restart. But UT’s Dylan Osetkowski netted six points over a four-minute span to help the Longhorns extend their lead to 39-30 with just over 12 minutes remaining in regulation. But a pair of Lagerald Vick 3-pointers on KU’s next two possessions, along with five-straight points from Lawson, helped KU shave its deficit to just three points, 46-43, with less than seven minutes to play. Osetkowski used some impressive free throw shooting over the next four minutes, going 6-for-6 from the stripe. Those charities, combined with a pair of Jase Febres 3-pointers, got the Texas lead back into double digits at 58-47 at the 3:37 mark. The Jayhawks made one final push and cut the UT advantage to four points with 30 seconds left on the clock, but the Longhorns’ free throw shooting again thwarted the Jayhawk momentum as UT went 6-for-6 from the line to close out the game and the victory, 73-63. Agbaji led the Jayhawks in scoring for the first time in his young KU career, going 8-for-10 from the field for a career-best 24-point outing along with seven rebounds. Lawson added 13 points, 11 of which came in the second half, while Vick rounded out the double-figure scoring Jayhawks with 10 points. UT closed the game going 21-of-23 from the free throw line along with a 10-of-28 clip from beyond the 3-point line.